Near a 3-Year Low, Is Skyworks Solutions a Buy? If this chipmaker is empowering the wireless revolution, why is its stock getting hammered? The past 12 months have not been kind to shareholders of Skyworks Solutions (NASDAQ:SWKS). The stock is down 32.1% year to date, and off 44% from its 52-week highs this past March. Unfortunately, the pain did not begin for Skyworks shareholders in 2018. The company is now near three-year lows, approaching prices last seen in January 2016. 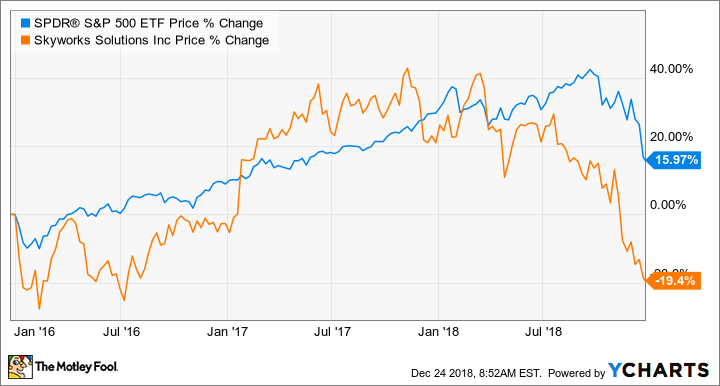 Over the past three years, the stock price has retreated 19%, all while the S&P 500 index has inversely mirrored it, appreciating 16%. The company's analog semiconductors, so important to today's wireless revolution, are practically ubiquitous in smartphones, tablets, wearables, and a host of other devices and applications requiring connectivity. As 5G wireless networks get closer to reality, the list of uses for Skyworks Solutions' semiconductor chips should only grow. So, with these obvious tailwinds, it's only natural to wonder what's going on with the company's stock price. Doe the current dip in price represent a buying opportunity, or is it an ominous sign pointing to deeper problems? Let's see if we can determine what's going on. Skyworks Solutions analog semiconductor chips power wireless connectivity, a key to the Internet of Things (IoT). Image source: Getty Images. A quick look at the company's metrics will tell you that the latest results are not to blame for the stock's current woes. In the company's 2018 fourth quarter, revenue rose to $1.01 billion, a tepid 2.4% increase year over year, and the company's adjusted earnings per share (EPS) grew to $1.94, a 6.6% increase over the prior year's fourth quarter. The company's non-GAAP operating margin remained strong at 37.5%. While the company's growth remains modest, the valuation is absolutely scintillating. For the full fiscal year, revenue rose 6% to $3.87 billion, and adjusted EPS increased 12% to $7.22. Based on this adjusted EPS, the company's P/E ratio is 8.9, far below the overall market's multiple. The primary problem investors had with the latest quarter was management's guidance calling for declines in revenue and earnings in Skyworks' upcoming quarter. Based on its 2019 Q1 guidance, management seems to expect revenue to decline 3.9% and adjusted EPS by 4.5%, both year over year. CEO Liam Griffin did his best to reassure investors, however, that Skyworks' outlook for 2019 remained bright, saying, "Despite the near-term market weakness, we have a clear path to deliver our 10th consecutive year of revenue and earnings growth in fiscal 2019." So, what's causing near-term headwinds for the company? The culprits will be familiar to long-term Skyworks shareholders: softness in Chinese markets and a decline in premium smartphone sales. During the company's fourth-quarter conference call, Griffin reiterated that China remained an important market for Skyworks and that the company continued to enjoy strong relationships with the major smartphone manufacturers in China, calling out Huawei, Oppo, and Vivo by name. He maintained that the company's business in China was in line with its expectations and that there is usually a seasonal decline in the current quarter, but then the China market begins to rebound in the new calendar year. Griffin even said there was an opportunity for Skyworks to take market share in some of China's midtier smartphone manufacturers, as more Chinese consumers upgrade to 4G wireless subscriptions. Skyworks is also experiencing growing pains over the saturation of the smartphone market in developed economies. This holds doubly true for Apple (NASDAQ:AAPL), its largest customer. As I've said before, "Every time Apple sneezes, Skyworks is diagnosed with the flu." Without specifically mentioning Apple by name, Griffin did allude to the fact that declines in iPhone sales were again the "fundamental issue." At these prices, there is much to like about Skyworks despite these concerns, and I believe it remains a strong buy for investors at valuations this low. Wall Street often obsesses over the immediate future, ignoring the long term, but it doesn't take a soothsayer to see how Skyworks' future might be bright. There are two reasons to remain bullish long term. The first is the company's increased content in 5G-capable phones. With each successive generation of wireless networks, Skyworks' amount of dollar content in phones has increased substantially. For instance, in 3G phones, Skyworks had the equivalent of $8 in components. In 4G phones, its material content jumped to $18. With 5G phones, it will have upward of $25 of material and content -- almost a 40% increase per phone! [W]e are capturing large-scale design wins across all key segments, spanning industrial, home automation, enterprise, automotive, and defense as well as numerous flagship mobile platforms ... [T]he broader IoT category continues to accelerate. With expanded 5G network capacity on the horizon, we expect 75 billion devices will be connected by 2025. That's three times today's installed base ... [W]e are well positioned to capture a disproportionate share of this growth, particularly with the advent of autonomous vehicles, virtual reality, Industrial IoT, and frictionless commerce." Investors need a long time horizon to beat the market. I believe Skyworks Solutions is going through what Motley Fool co-founder David Gardner describes as dark clouds he can see through. In other words, while the company is undergoing some short-term problems, long-term investors can see light on the horizon. That light comes from more dollar content per phone and more devices that will be using Skyworks' chips. While we can never know what the future holds, I think it would be a huge mistake for shareholders to sell Skyworks Solutions at these prices. I am much more inclined to add at these levels than sell.